Vacation Village at Parkway is the home base for your sun-drenched Florida vacation. The resort boasts all the comforts you'd want in a deluxe suite accommodation and then some! The resort offers 6 swimming pool to cool off after a day at the exciting local attractions, a picnic area for a breezy breakfast or supper under the stars, and even a tot lot for kids. Don't forget to explore the area's excellent sporting and nearby shopping amenities! 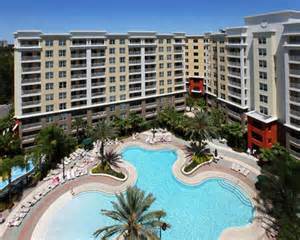 Vacation Village at Parkway offers the best of a great Florida vacation: exciting entertainment, fabulous shopping, thrilling recreation, and great restaurants for any taste or budget. 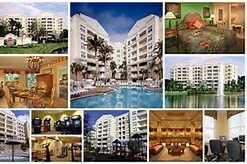 The resort is minutes from Disney World's Magic Kingdom Epcot, SeaWorld and Universal Studios. Visit charming, historic St. Augustine; the Kennedy Space Center, home to the nation's shuttle space program; beautiful Busch Gardens, and enchanting Silver Springs. Vacation Village offers beautiful suites featuring: common foyer with separate controlled access for each suite;1, 500 square feet of combined living space if both sides of the unit are booked; dual-access bathrooms, "A" units with a oversized tub and walk-in shower, a large screen television and compact-disc stereo system; additional color television in bedrooms; separate climate-control feature in each suite; individual living and dining rooms in each suite; king bed and sofa bed in suite A, queen bed and sofa bed in suite B; fully appointed kitchens; linens and bath towels provided; balconies or patios with tropical ambiance; weekly maid service, or daily maid service is available for a nominal fee; and washers and dryers on every floor.